This lesser-known but longtime VPN has good speeds and room for personal choice. PersonalVPN first debuted in 2005, and I have to say its desktop app looks it. 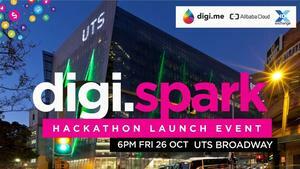 That’s not a knock against the service, just a comment on the program’s Web 2.0-ish appearance. 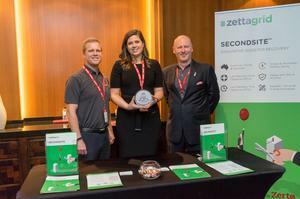 The company tells me we can expect to see an overhauled client later in 2018, after it refreshes the personalVPN website and customer portal this spring. The primary starting point for WiTopia’s personalVPN on Windows. At the top of the interface are links to various items such as WiTopia’s website, support, and so on. Below that is the meat of the VPN program. It has five tabs including Connect, Connection Log, Map Overview, Preferences, and Custom Gateways. 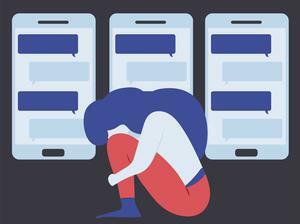 For most users, it won’t be necessary to go beyond the Connect tab. There are two options here Quick Connect and Advanced Connect. Quick Connect finds the closest gateway (server) to your location to get the best performance possible. 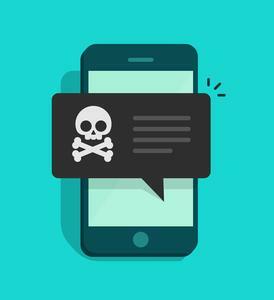 It automatically uses OpenVPN to connect using a 4,096-bit security certificate that is unique for every user. Anyone who wants to connect to a different country to get around geographic restrictions will click on Advanced Connect. From this page you can pick from among personalVPN’s 45 different country options. There are tons of U.S. locations to choose from, and three different Canadian ones. For other countries there are generally one to two options. The Advanced Connect option for personalVPN. 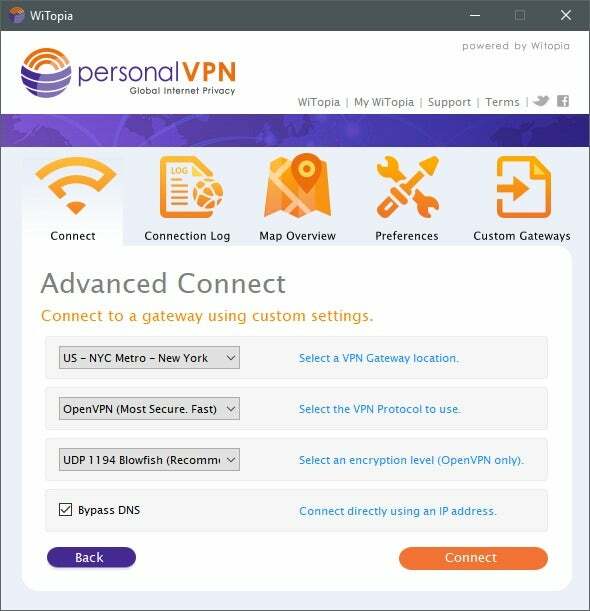 Once you’ve selected your country, personalVPN requires you to choose your preferred VPN protocol including OpenVPN, IPSec, L2TP, and PPTP. If you’re not sure which one to choose, personalVPN includes some helpful hints in the drop-down menu. OpenVPN is listed as fast and most secure, for example, while IPSec is rated as “very secure” and the “fastest” option. Once you’ve selected your preferred protocol, the program automatically chooses your data encryption level, and then you can hit Connect. Once you’re connected, the small map shows a pin in your new virtual location. The map isn’t interactive, but purely informational to show where your new location is. 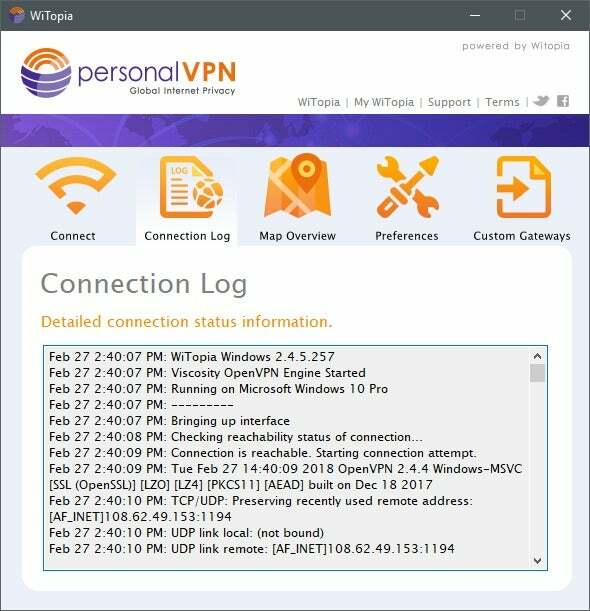 With a connection in full swing, the Connection Log will show you the basic events of your VPN connection. This includes when a connection attempt starts, the port used, some routing table information, and so on. This is helpful for power users who want to check out what’s going on, and can come in handy should you have any technical problems. The Map Overview tab shows you all the possible locations available on personalVPN using OpenStreetMap, with a pin for each available location. And that's it, unfortunately. Clicking on a pin won’t show you any details about that location—you can't get close enough to see country names, or even basic locations within each country. You also can't connect by clicking a pin. There’s already a list of country and city locations under the Advanced connect button, so this semi-interactive map seems superfluous. 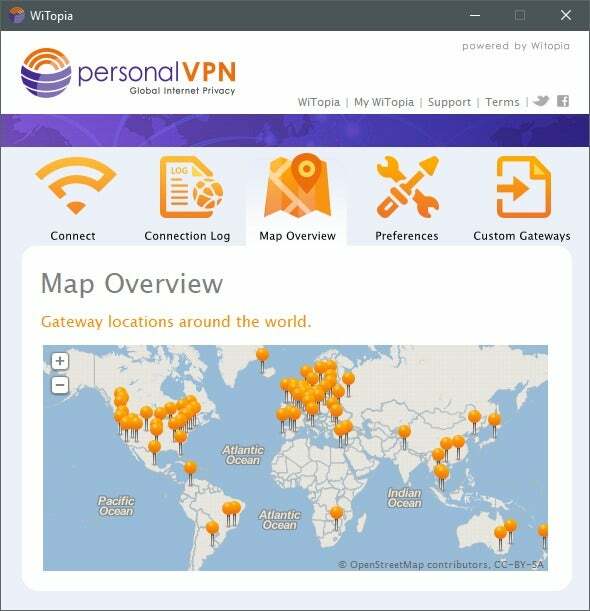 The informational map in personalVPN. Under Preferences you’ll find a few items that you can customize to your liking. By default, personalVPN uses OpenVPN, but you can change the default under Preference > General. Preferences > Auto connect lets you choose a preferred gateway that WiTopia will use when you choose one of the auto-connect options, such as connecting to the VPN at startup or when you’re on an insecure wireless connection. Under Networking you can change the DNS provider to a preferred service by using the manual DNS settings. Under Advanced there’s an option (automatically enabled) to disable IPv6 network traffic while connected to the VPN, and the option for a “low-profile mode” that doesn’t try to locate your current general location when WiTopia turns on. Finally, there’s the Custom Gateways option, where you can customize a set of connection parameters and save them for easy access. 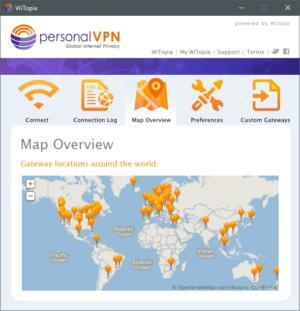 PersonalVPN offers two different tiers of service: personalVPN Basic and personalVPN Pro. The biggest difference between the two is that basic doesn’t offer OpenVPN as a possible protocol—only options for PPTP, Cisco IPsec, and L2TP/IPsec. 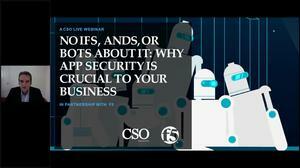 Both options offer apps for Windows, Mac, Android, iOS, and ChromeOS, along with manual instructions for Linux. There are also a few routers for sale with personalVPN compatibility built-in. 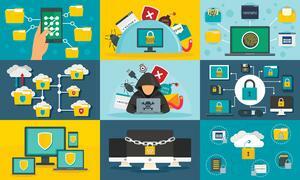 At this writing there were also mentions on the site of compatibility with Windows Mobile, BlackBerry PlayBook, BlackBerry Z10, and HP WebOS—obsolete platforms whose presence seems to confirm that personalVPN's website needs updating. As I mentioned earlier the company is working on an overhaul of the site and the customer login section, which should be ready in late March/early April. PersonalVPN Basic costs $50 per year, while the Pro version is priced at $70. Given that the basic version lacks OpenVPN, you’d probably be better off going with personalVPN Pro. WiTopia offers options to pay with credit card or PayPal. There are no options for cash or pseudonymous cryptocurrency payments, but that may change once the new website and portal are ready. Despite WiTopia’s advice that IPSec was its fastest connection, in my tests the OpenVPN option easily outpaced it. Using OpenVPN, personalVPN scored 43 percent of the base speed using an average over five locations, while IPSec only did 25 percent of base. A 43-percent speed retention is pretty good, but that doesn’t tell the whole story. The overall average was brought way down by abysmal performance in Japan, with speeds below 1Mbps. However, both the United Kingdom and USA connections were over 60Mbps—the base was 90Mbps on the day of testing—while Germany was pushing over 45Mbps, and even Australia was getting close to 20Mbps. The bottom line is that personalVPN should be plenty fast for your needs. Though I say that with the usual caveat: Your experience may vary depending on your base Internet connection speed, devices, Wi-Fi vs. ethernet, and time of day. 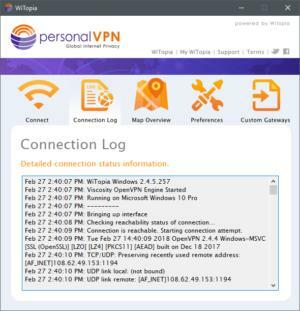 The Connection Log in personalVPN. WiTopia’s mailing address is 11654 Plaza America Drive #316, Reston, Virginia, which is a mailbox at a UPS Store in the Washington, DC area. The company doesn’t list its management on the site, but the CEO is Bill Bullock and the CTO is Steve Shippa—they are the co-founders. Both Bullock and Shippa were executives at UUNET an early Tier 1 Internet provider that was sold to Verizon in 1996. There are eight employees of WiTopia listed on LinkedIn, most of whom are in the Washington, DC area. WiTopia’s personalVPN is a great service with plenty of speed to go around. 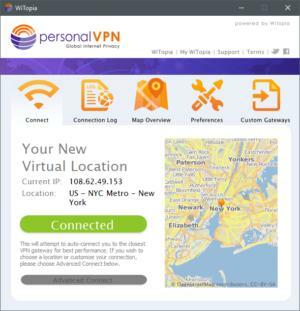 As we saw with VPN Unlimited, the service could stand to do something a little more modern with its map, which we may see in the coming months. As a service for basic privacy and solid speeds, personalVPN is a good choice.